You are to design the colour scheme for a 'card' glider. The colour scheme will include logos and symbols to reflect a variety of themes. The basic shape and form of the glider is seen below. The important parts of a glider have been labelled as they all have very important functions when a glider is in flight. These are also explained below. THRUST - The power required to allow lift off of the glider and to maintain flight. An engine and propellers normally provide thrust. 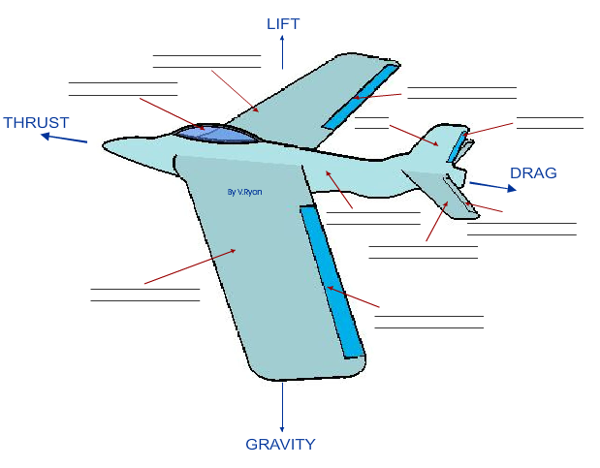 DRAG - Resistance is produced as air passes over the surfaces of the glider / aircraft. This slows down the glider / aircraft. LIFT - Is created by the shape of the wing. The wing is designed to force the glider / aircraft upwards as the air flows on the top and bottom surfaces. RUDDER - Controls the movement of the glider from left to right. WINGS and TAIL PLANE - These stabilise the glider. In a powered aircraft the wings also contain the fuel tanks. COCKPIT - The pilot sits in this area controlling the instruments that allow stable flight. 1. Complete the diagram by adding all the labels to the glider drawn below. 2. Explain each of the keywords listed on the left hand side of the page. Write a short sentence for each one.